Her hair grows short, long or in between. Tressy's hair makes her a Queen! American Character's Tressy doll is a 11 1/2" tall teenage fashion doll with growing hair, painted facial features, she's jointed at the neck, arms and legs. 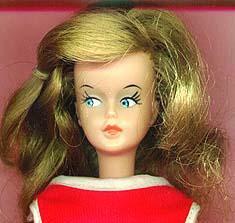 All Tressy dolls have an identifying doll mark on the back of her head American Char. 1963 in a circle. Other family dolls are; sister Cricket called Toots in the European market and Tressy's friend Mary Makeup. Tressy's clothing line was called Budget Fashions, some of the names are; Pink Champagne, Campus Casual, Shaking the Night Away, Soda Pop Cutie, Car Coat, Chic Shift, Hootenanny, Evening Date on the Beach. The Palitoy, Bradgate division of England marketed a grow hair Tressy / Silky doll line in Europe as did the Regal Toy Limited Company of Toronto, Canada in the Canadian market. 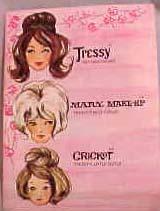 In 1967 the American Character company made a settlement with their creditors and then went out of business in 1968, several doll patents were sold to creditors Ideal and Mattel, in the 1970s Ideal used the grow hair patent feature for their Crissy and friends dolls. 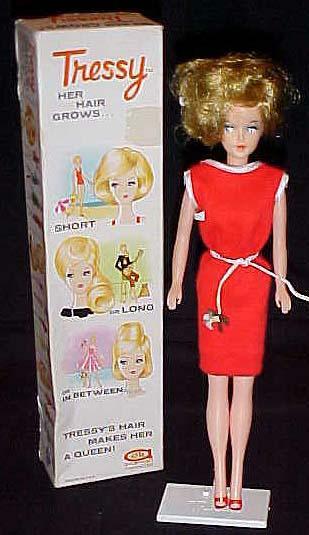 Tressy doll is shown on left in her original box with red knit sleeveless dress a white soutache band around the arm holes and neckline a white cord belt and white open toe shoes, and her key to make her hair grow. 1964 Tressy head close up, Later Issue (shown at top of page), the first issue Tressy dolls have heavier eye makeup in green eyeliner, later dolls have gray eyeliner. 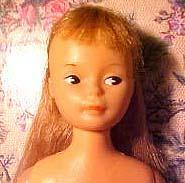 1965 Tressy Makeup Doll (not shown) - this doll has the grow hair feature along with a waxy unshiny makeup face that you can use cosmetic's to color the dolls face and change the hair color. These products could only be used on these particular dolls. 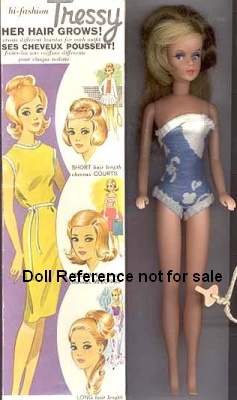 (shown left) This doll was sold by Regal Toy Limited of Toronto, Canada, Patent 693746. The box text is in both English and French, you can see the key that was used to insert into the dolls back, then push the button on her tummy to make her hair grow. (shown left); The dolls in this time period all seem to have to do something, Mary's feature was that her face is waxy, so a child could apply makeup that later could be easily removed. She's the same size as Tressy 11 1/2" tall and can share her wardrobe. She originally came wearing the same red knit dress as Tressy. She does not have the grow hair feature though. 1965-1967 American Character Cricket doll, 9 1/2"
Cricket was introduced as Tressy's little sister, she's about 9 1/2" tall, hard plastic jointed body, vinyl head with rooted hair, painted facial features, closed mouth, the first issued doll had long straight hair and bangs, the later dolls have the grow hair feature. Cricket was called Toots in the European market and was produced by the Palitoy Company of England.